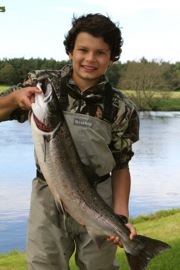 Latest image added to our “Your Pictures” page is of Will Taylor from Cheshire with a 10lb Fish at the Lees on Monday 20th August 2012. This entry was posted in Uncategorized and tagged Angling, fishing, FishTweed, Lees, River Tweed, salmon, Tweed, Your Pictures. Bookmark the permalink.